When you mix guns, wild beasts and Mother Nature, danger is inevitable. Most hunters are already familiar with Big Five game, a term coined by white safari hunters to describe the 5 most dangerous and challenging animals to hunt. Here we'll look at the Big Five, and other dangerous creatures you may not have expected. 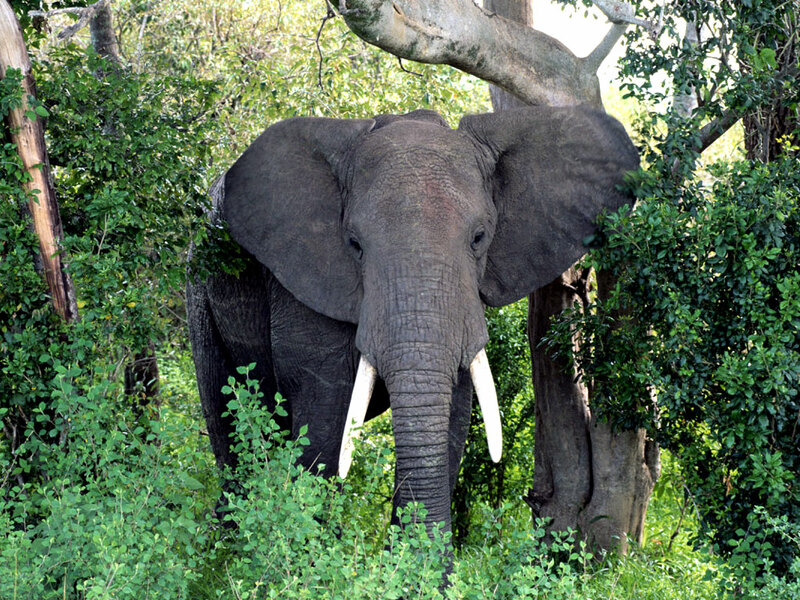 For the seasoned safari hunter, African elephants can be a shooter’s most challenging and dangerous target. African elephants differ from their Chinese or Indian counterparts both in size and in temper. Males can stand up to 13 ft tall and weigh over 7,000 lbs and both males and females have large tusks that can measure 8ft and weigh nearly 100 lbs. They are also highly intelligent creatures with brains strikingly similar to that of humans’ in both structure and complexity. Now, merge their weight, size and intelligence and you get “elephant rage”. Elephants have been known to attack villages and go on human killing rampages (mostly when provoked). They are fearless and highly protective of their young ones and herds. They can be very vengeful and will charge at 15 mph to trample you into the ground if they feel threatened. A rhino’s size and speed once made it one of the most dangerous animals to hunt. Due to excessive poaching however, all five specie of rhinoceros are now threatened with extinction, with the exception of the White Rhino which can be hunted in South Africa and Nambia. These brawny beasts can measure 6ft and weigh 1 to 4 tons. 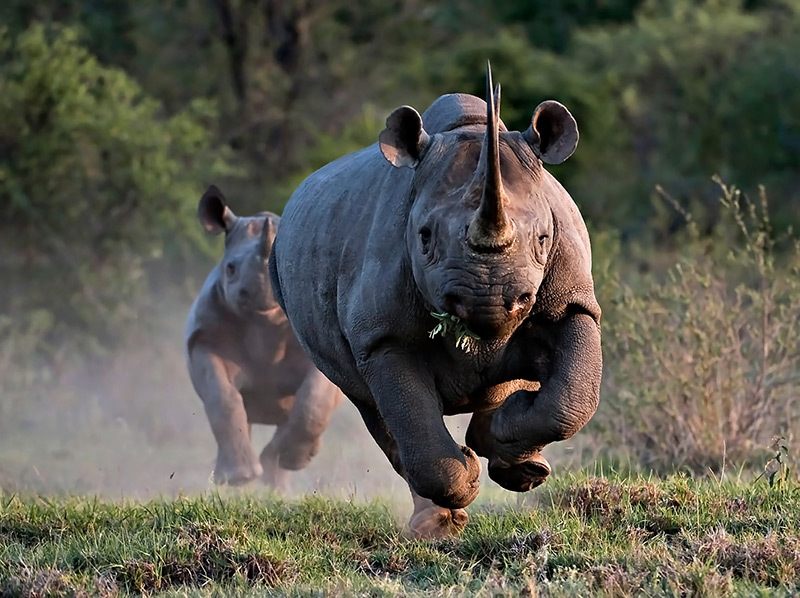 Despite their weight, rhinos can charge at speeds of 30 mph. And even though they are such large creatures they are very good at making themselves “disappear”. Big Game hunters consider them one of the most difficult and frustrating game to hunt. If you don’t associate “hippo” with “vicious, aggressive man-killer”, you are clearly not watching enough Animal Planet. Hippos kill more humans than any other animal in Africa (second to disease-carrying mosquitoes). Hippos are extremely territorial, highly unpredictable, and notorious for tipping boats that make the mistake of infiltrating their patch of water. What makes them most deadly however, is their bite. 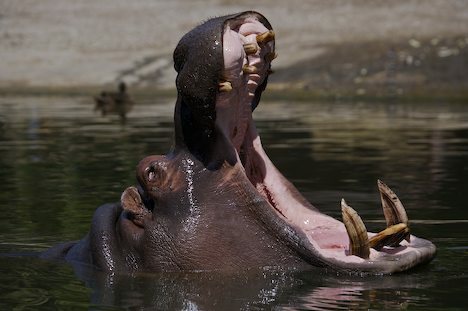 A hippo’s mouth can open 180 degrees. When it opens this wide it means the hippo feels threatened. Which means, so should you. One chomp from one of these monstrous water Goliaths can have 1,821 lbs of bite force! 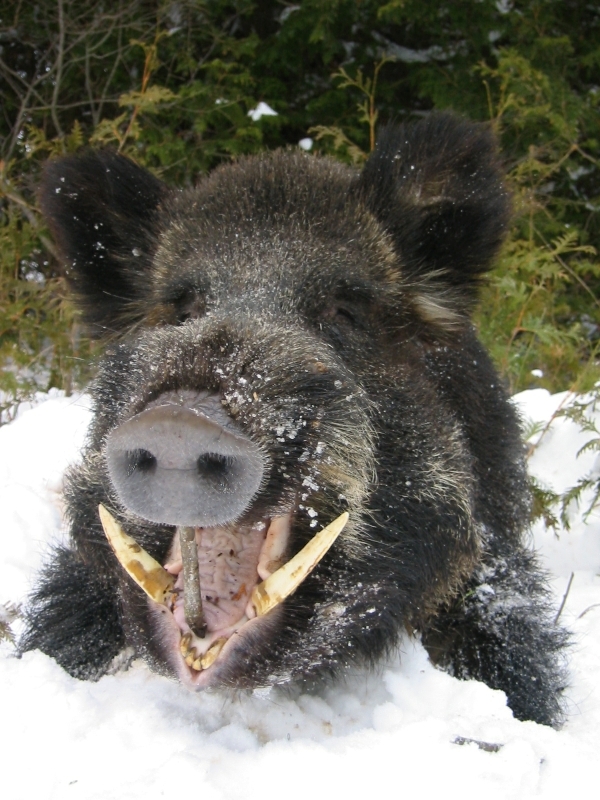 Their canines and sharp incisors (which they sharpen as they grind) can reach 20 inches in length. Get in the way of the their water, or calf, and you are up against a whopping 8000 pounds of bull rage that can charge at 18 to 30 mph! Also known as Black Death, the Cape Buffalo can be extremely dangerous, and is said to have killed more big game hunters than any other animal in Africa. An impressive creature, males can reach heights of 6ft and weigh a hefty 1, 750 lbs. A record-sized savannah-type male actually weighed 2,200 lb! 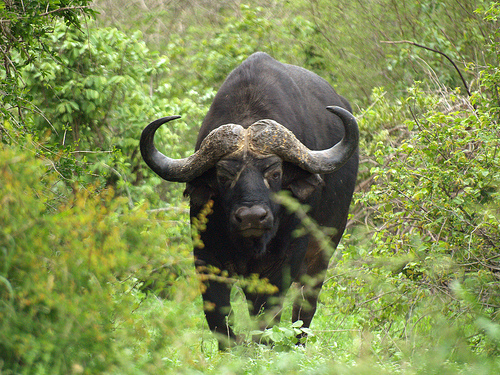 Cape Buffalo is most aggressive when it has been wounded, or, if one of the calves from the herd is under attack. Since the average shooting distance on a Cape buffalo is between 20 and 60 yards, be prepared to run like hell if your shot doesn’t bring it down. An angry buffalo will circle and stalk its prey, waiting for the perfect moment to tear apart its opponent with its massive, thick horns. Cape Buffalo are also known to engage in mobbing behavior when fighting off predators. Now, think about an angry mob of Cape Buffaloes charging at you at speeds of up to 35 mph. When you’re this scary, they call you Black Death. A reported 200 people die in the jaws of the Nile croc every year, though many estimates say that number could be much higher. 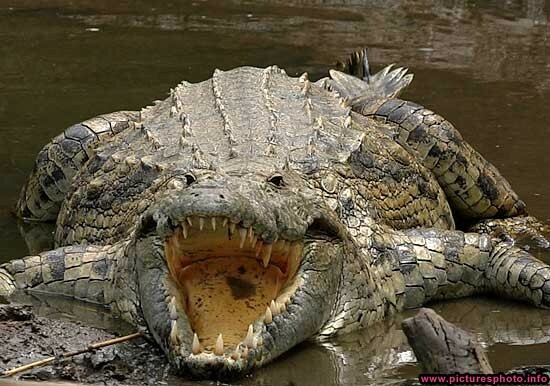 Crocodiles can move very fast over short distances, in and out of water. Once they catch you, their gaping mouths filled with 68 frighteningly sharp, banana-shaped teeth, bite down at a force of 5,000 pounds per square inch. The strongest bite of any animal. The only way to outsmart the croc is to play on his weakness, which- curious enough- is his mouth. The muscles responsible for opening its mouth are very weak, meaning, that if you’re ever wrestling a crocodile, your best chance at survival is to keep its trap shut. Then, find a stick to hold its mouth open, so that when you eventually do let go, you won’t be the first thing he bites down on. Given a bear’s size, diet and claws, the dangers in hunting this type of game are high. Kodiak bears are among the most perilous bears to hunt, not only because they are so large and strong (the largest of brown bears) but because of the rough conditions of the Alaskan Archipelago, where they reside. Kodiaks are highly intelligent and have a keen sense of smell that can track a human from very far distances. 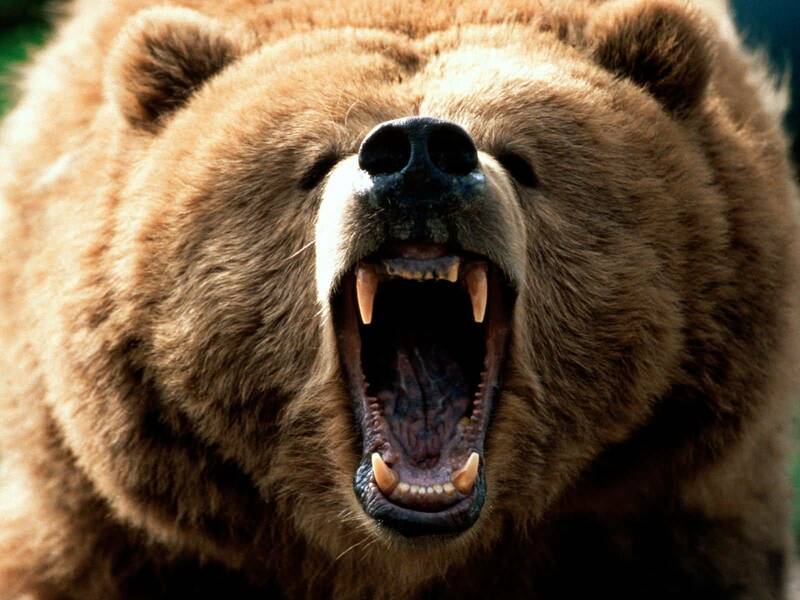 Male Kodiaks can range between 800 and 1500 lbs, have very large, sharp claws and tower over at 7 to 9 ½ ft. Tip: Never run from a bear. They are much faster than you. Hide in a tree. A survival tip: Pick your tree ahead of time so you can climb out of harm’s way if ever you’re being chased. 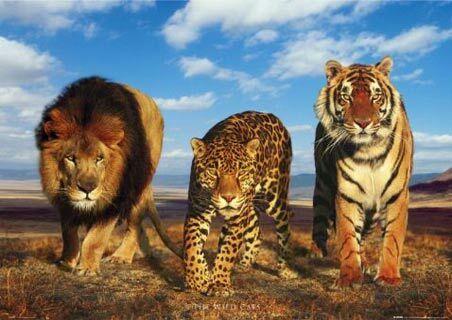 Lions and leopards and other big cats like tigers, are some of the most challenging and dangerous animals to hunt. Both lions and leopards have exceptional night vision, shrewd intelligence, fearlessness, speed and agility. A lion can cover 100 yards in 3 to 4 seconds. Since leopards are nocturnal hunters (and hunting them with a light is illegal) they are incredibly challenging to catch in the dark. They are opportunistic hunters, and make use of all their heightened senses, especially hearing and smell. They're also known to prey on humans.